It’s been an amazing 6 months but sadly my term at SplitcoastStampers is over. Fun doesn’t even come close to describe my time with the Dirty Girls. The themes were so creative and allowed us so much free rein to come up with truly awesome creations! Now that my term is up, I am free to blog my cards! This box was absolutely one of my favourite creations. 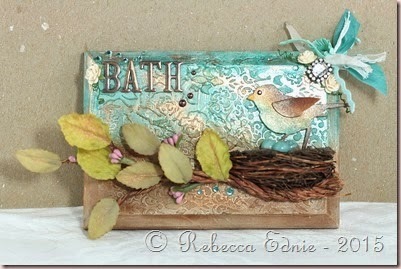 It seems anytime that I work with Maggie Holmes products from Crate Paper, I make something I REALLY love! The box was plain so I covered it with some 12×12 paper from the Bloom collection. 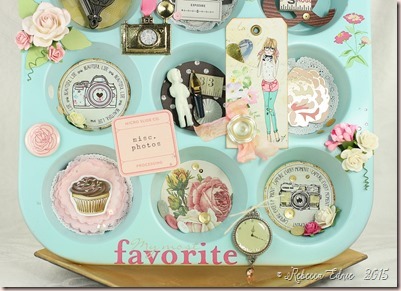 Everything else except the ribbon, buttons, sequins and sentiment are from one Maggie H collection or another. Layering all of these beautiful embellies made me so happy! 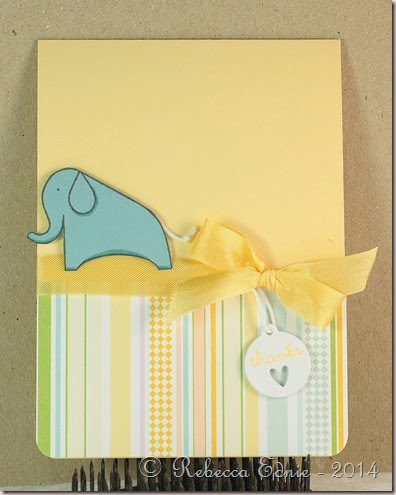 I can’t wait until a friend or family member has a baby so I can give a sweet little gift in there. I will be coming back later in the week with some more cards and a book review (or two!). I have boys and they really aren’t into the crafts I do. But I’ve been contacted by a publisher and given some books to review for free. While I was given the books, I was not required to review them favourably or otherwise, and everything I write is my unbiased opinion. Surely many people reading this blog also make cards. But do you also do art journaling? It’s so much fun and uses all the same supplies! 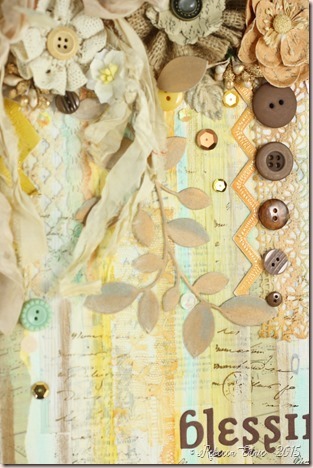 You can make your own journal or just bind some pages together after you created enough for a book. I have two art journals I work in and another I swapped. The first two are hardbound, one with sketch weight paper and one with much sturdier paper. I use the study one for my final products and the sketch paper one for trials and experiments. The swap journal was one I made, decorated a two page spread in and then it was sent on it’s way to have pages done by people all over the world! It finally made it’s way back to me after over two years and I was thrilled with the art I received! This particular page was done as a loose page swap (no book was mailed around the world) which ends up much cheaper in the long run and if a package goes missing, at least it’s only one page rather than a whole book. The theme was Julie Nutting summer. Well, as you probably know if you visit here regularly, I am IN LOVE with the BEACH! 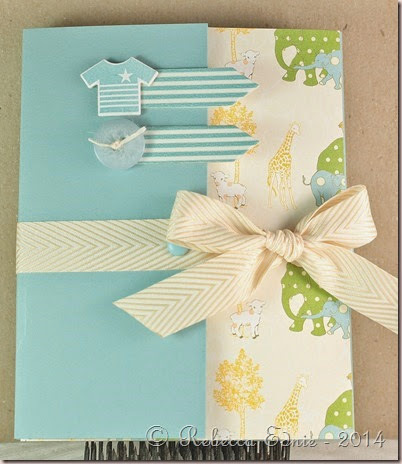 So I have lots and LOTS of fun supplies to use when making this page! It would take ages to list all the supplies so leave me a comment or email me if you’d like to know more about something specific. Wow, it went from almost summery to SNOW in less than a week! Seriously? Gotta love southern Ontario ‘autumn’. 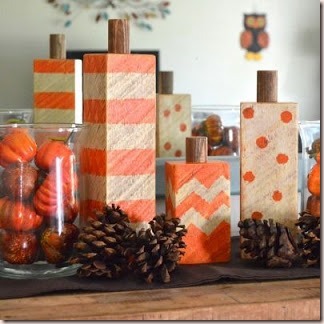 So with a chill in the air, I made this super shabby fall decor piece for The Shabby Tea Room this week. I started with a plain white canvas-covered board. I prefer the look of a wood frame canvas but boards are not only easier to work on but it was all I had in this size! 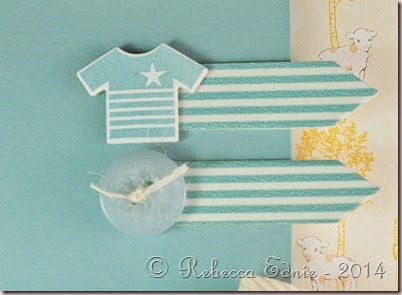 I applied strips of music, text and scrapbook papers along with washi tape and lace with gel medium. Then I went over it all with a light coating of gesso. Next I added watercolour in long thin streaks. Some overlapped the lace but most was on the canvas itself. For the foliage, I die cut plain ivory cardstock and coloured it in with gilder’s paste using both antique gold and patina which is the mint colour you also see on the canvas. The chevrons, which I added to help reflect the inspiration photo, were coloured with watercolour then covered in Crackle Accents. Next I went to town embellishing the canvas using Prima flowers, gold berry clusters, buttons, sequins and a big reclaimed sari silk bow. I found quite a few sequins that matched perfectly and I was happy to find I had brown buttons in the perfect sizes for the ‘dotted’ effect I was looking for. I thought they helped by bring in the dots from the inspiration photo. I really hadn’t planned to bring in the mint colour but I accidentally grabbed the patina (mint) colour of Gilder’s Paste before the antique gold one and I realized it brought a fresh pop to the autumn colours. So I added even more with the buttons! 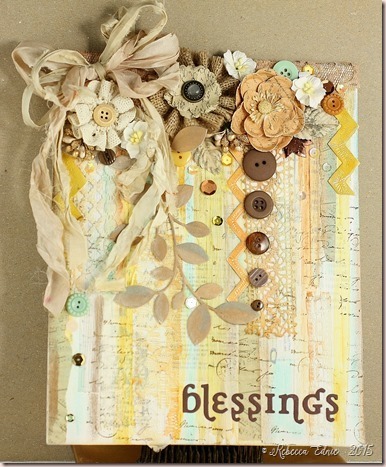 I die cut the ‘blessings’ letters in a more whimsical font but it didn’t work well so I tried this one. It’s way old, from Quickutz back when they had the Squeeze tool! Anyone been die cutting long enough to remember those? Ugh, I can’t tell you how many incomplete cuts I got with that thing; I have weak hands. I really like this font because its like a typewriter font but with some added whimsy. Last but no least I added a bit more texture using some brown ink and a script stamp. I hope you like the inspiration photo and join us this week! Remember, our name is shabby, you project doesn’t have to be! We accept any type of project and any style! You know you waaaaaanna! But even if you only visit, be sure to leave the girls some love! We all thrive when we get great comments. I LOVE the papers our sponsor for The Shabby Tea Room gave us this week! They are fabulous. Kuddos to Digital Papers by Janet! I looked at the page I had just printed out and I noticed they perfectly matched this muffin tin I thrifted and spray painted. Awesome! So I spent the better part of three days finding little odds and ends to add to this. I finished it with lots of sequins and rhinestones. I just love vintage cameras! Especially this type with the accordion sides. The camera circles and the tags are the digi papers. You can link to them directly from the links above my project on The Shabby Tea Room or the link above to Janet’s store. 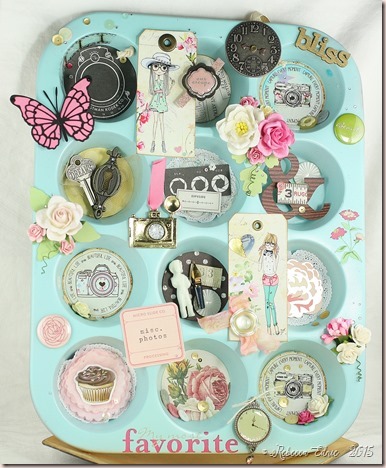 Other camera themed die cuts were found on a die cut pack by Maggie Holmes. I’m not sure which collection it’s from. Please let me know if you are wondering about a specific product. I’d be here all night if I tried to list everything. I hope you will play along with our challenge this week! 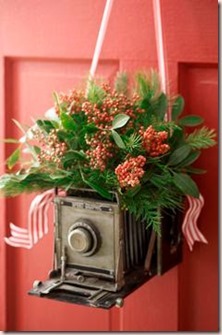 I love cameras but you can also be inspired by wreaths, autumn colours or anything else you see in the photo! We love shabby projects but we accept any style! 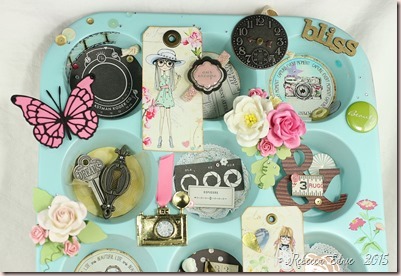 Be sure to visit the blog to see all the fabulous creations and leave the gals some LOVE! I’ve been wanting to make a bathroom sign for a long time. We have two doors close together and even when we direct someone to the washroom, they aren’t sure which door to open. We had a nasty computer paper printed sign in the ugliest font ever since our annual BBQ last summer. I was so sick of looking at it! So I pulled out a plaque that hubby brought home from work. Ya know those ‘employee of the month’ type cheapie plaques? Yep, one of those. It’s not real wood so I sanded it down enough to let gesso stick and covered it in 4 coats. Then I covered part of it in the damask stencil using molding paste. I allowed that to dry then added white crackle paste in a fairly thick layer to the unstencilled areas. 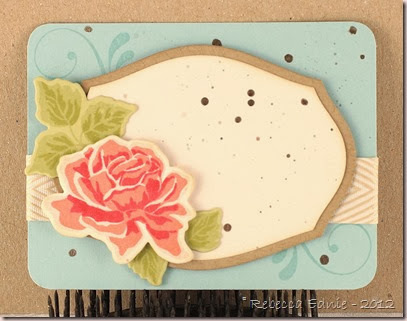 After that dried, I added the roses stencil over the crackle. So much glorious texture! 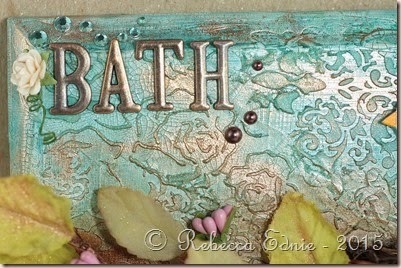 (check out the area under the BATH letters in the above photo) Then I added some mists over top. I added a mist to the bottom too but I didn’t like the colour so I over coloured it in Copic airbrushing. That was much better, a warmer colour. Next I started to work on the nest and branch. The nest was premade but I had to cut it in half first. Before cutting it, I applied some gel medium to the area where I planned to cut it. Not such a good idea. It didn’t dry completely clear so I had to colour it and cover it up with some raffia. What a pain! I’d recommend white glue if you ever need to do something similar. To make the branch, I used some wire covered in some sort of natural twine type stuff. I twisted 5 pieces together, shaped them and glued on the leaves and buds. 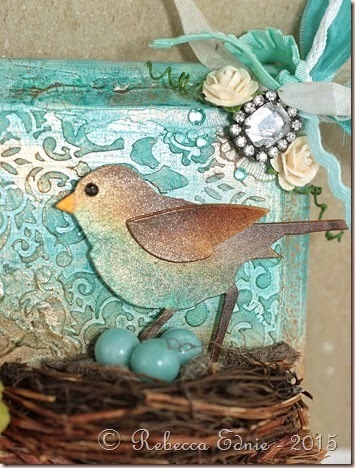 The bird was made from 5 layered ivory die cuts coloured with Copic airbrushing. I used a black rhinestone for the eye. I added 3 beads to the nest for eggs. Then last but not least, I added the copper Perfect Pearls, the letters and the rhinestone and ribbon bundle along with some bling. The rhinestone already had a loop on it and that’s how I tied on the ribbons. I really wish you could see this in person; it’s soooo much prettier! I’ll try to add some closeups later. I made this for the Monthly Mixed Media Challenge. 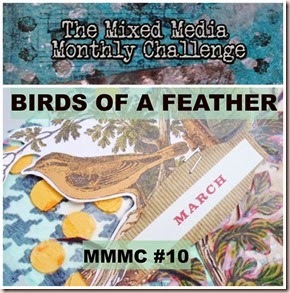 This month’s theme was Birds of a Feather. Click the graphic to visit the challenge. 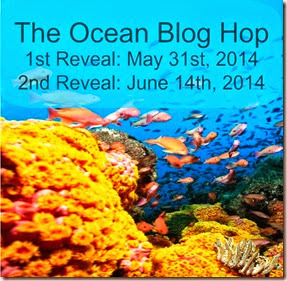 Welcome to my late entry for the Ocean Blog Hop. Between being being very busy and late with my blog post and the hostess missing my name so I wasn’t added to the original line up, I’m hoping I get at least a few comments! I’m afraid my before photos are dismal. I took them in low light with my iPad and as cool as Apple devices are, their phones are not known for their low light amazingness. This is of course not all I received, some were already in their pieces and I received a larger quantity of some that didn’t fit in the photo. 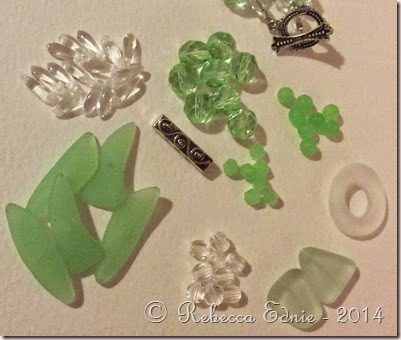 Of the two small green ones, some are round and some are faceted. They seem to be cultured sea glass, the round ones were between the freeform stick shaped beads and the faceted were packaged separately. This is a really hard necklace to capture in one shot with the equipment I have anyway. 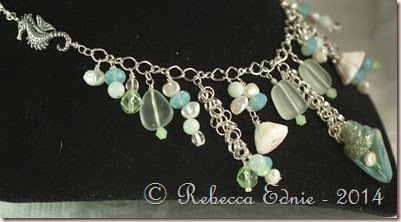 I used the items above plus some shell beads, amazonite, Swarovski crystals, freshwater pearls and some nifty chain. 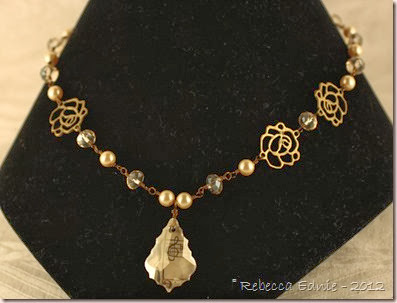 What I couldn’t show you above in the supply photo were the pretty sea horse charms I used in the necklace. I also used to have Swarovski crystal starfish on the end of the dangle with the circle chain and multiple beads at the end but as I only had one, I took it off for now. The focal bead is from Unicorne Beads which I bought from ArtBeads. I’ve been wanting to try bead wrapping for a while so I thought I’d had a go of it. I’m semi-happy with it. I like the right far better than the left which was the first one I did. You get better the more you do right? And now, my bracelet. Basic stringing and not that creative but I’ve never used spacer bars before so it was new for me. It wasn’t until after that I realized I had one more spacer bar and while I was making it, I’d been wishing I’d had another. But I’m never one to waste supplies and as I’d be wasting not just one strand of stringing wire but TWO, I just CAN’T restring it though I’m very tempted. I also wish it had more colour in it but I was determined to make one piece with nothing in it except the beads from the kit. I may add a charm though. 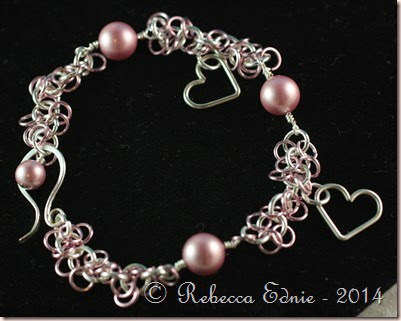 I did make one more piece using the bracelet from the kit but I have crappy photos and have since given away. I would have taken better pix before giving it away but I offered to make something for an Autism fundraising golf tournament silent auction without realizing it was 5 days away! By the time I got the reply and realized I had 3 days to make and deliver it, I was kind of in a rush. I packaged it without thinking and at the last second thought about pictures. Oops. It’s a shame I no longer own this lovely pendant but oh well. And I know it went to a good cause. Since you can’t see it well, I’ll explain the beading pattern. 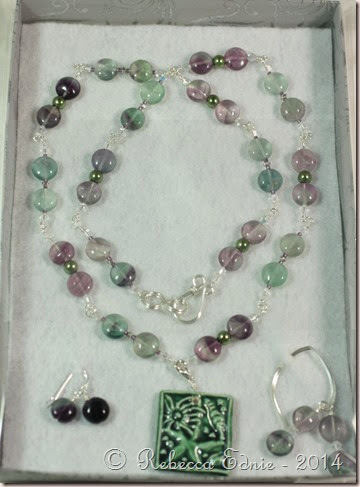 Purple seed bead (PS), Green Tourmaline coins(GT), PS, tiny white Swarovski bicones PS, GT, PS. Then for the other grouping, it’s a green glass pearl with purple tourmaline coins then a bit larger white Swarovski bicones next to that. Thanks to everyone who made it this far. These alternate all along the length. I attached the pendant with a lobster clasp so it can be removed in the cooler months. It’s hard to see, but I made my own hook and eye clasp. It’s the first time I tried a clasp like this and I’m really proud. Click on any photo to see it better. Thanks for reading this far and I hope you enjoyed my creations. I’ve been making lots of jewelry lately but I’m a bit behind posting. 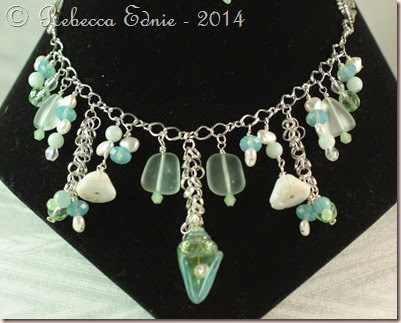 This one tinkles a bit as I wear it and so reminds me of faeries! It is made almost entirely of jump rings. So except for the pearls, it is all made of wire! The jump rings silver plate for the non-coloured ones and coloured aluminum for the pink ones. The pink is quite subtle so enlarge the pic by clicking on it if you’d like a better look. The little hearts are made from silver wire which I shaped then soldered closed. I also made my clasp, from the same wire I think. 18g silver. Considering I’ve never made anything like it before, I am thrilled with it! I’m really new to anything made with jump rings, called chain maille, and new to soldering too. I am going to be selling these so let me know if you are interested! The jump rings and pearls come in lots of other colours too. And if hearts aren’t your thing, I can substitute your choice of charms. If you know jewelry, it’s a basic chain made of the silver rings with two pink rings in each silver one, one on each side. All supplies available at Fire Mountain Beads or ArtBeads. I love using the sketch for something other than basic cards. 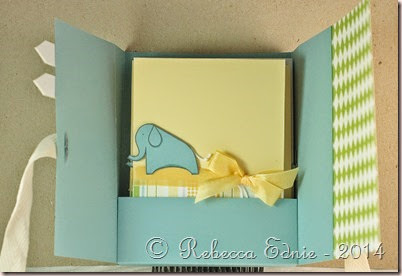 This week I was making cards for a friend who just had a baby and the sketch worked beautifully a folder to hold the cards. I used some Webster’s Pages papers to make this. The yellow ribbon looks so pretty. I love that shade of yellow and the chevrons are awesome. This is the inside of the folder. I designed it myself so if you like it and want the dimensions, let me know. 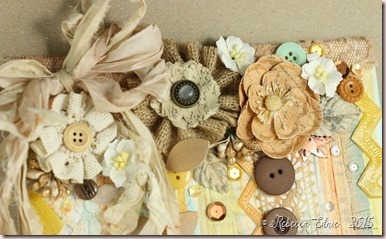 Here’s a closeup of the embellishments. The arrows are made from Craft-a-board then covered with white cardstock and washi tape. This is the card I designed. Sorry that it’s hard to read the tag; it says ‘thanks’. I made the card narrower than the usual 4.25”. It is only 4” which helped because I wanted to get the most from a scrap of 12” wide paper and of course, 4” fits across 3 times but 4.25 only fits twice. That also allowed me to hang the trunk off the edge and still fit into a regular envelope. 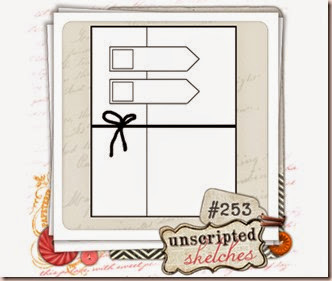 I hope you will join us at Unscripted Sketches this week. Be sure to check this week’s post to see if you won one of our prizes! I look forward to making the jewelry I am giving away. My winner is Monika Reeck so please email me in the next 48 hours to claim your prize. Paper: lemon tart CS-PTI, Baja Breeze CS-SU! I’ve been making more and more jewelry lately but dang it is it hard to photograph with out some sort of stand! Especially necklaces. Earrings are pretty easy but not necklaces! I FINALLY got a stand so yeah! This one is my favourite because it goes with pretty much anything! This one is actually a little bit crafty! I added vintage music paper to the back of the Swarovski flat backed baroque pendant (not all are flat on the back) with Glue and Seal then sealed the sides and back with the same. You can see how the facets reflect the light in the picture. I finally managed to take a good sharp picture that shows sparkle! I was starting to wonder where my photography skills had gone! PTI had issued a challenge to make a 3×4 card such as you would use for Project life but in this case you can decorate it in any way you wish just like you would an ATC! Nichole is even setting up a way to trade them if you wish! I have to make this quick as hubby just got home with the groceries so suffice it to say that except the gold spray, ribbon, pink and red ink and foam dots, everything is PTI. (The middle ink colour is melon berry.) The only thing about ink splatters I don’t like is dang it, I can’t control them. I am a bit of a control freak!! I’m not going to trade this, so it will likely end up as a mini card, a place card or a tag. It is a nice size. Enjoy the PTI 7th Anniversary Celebrations.